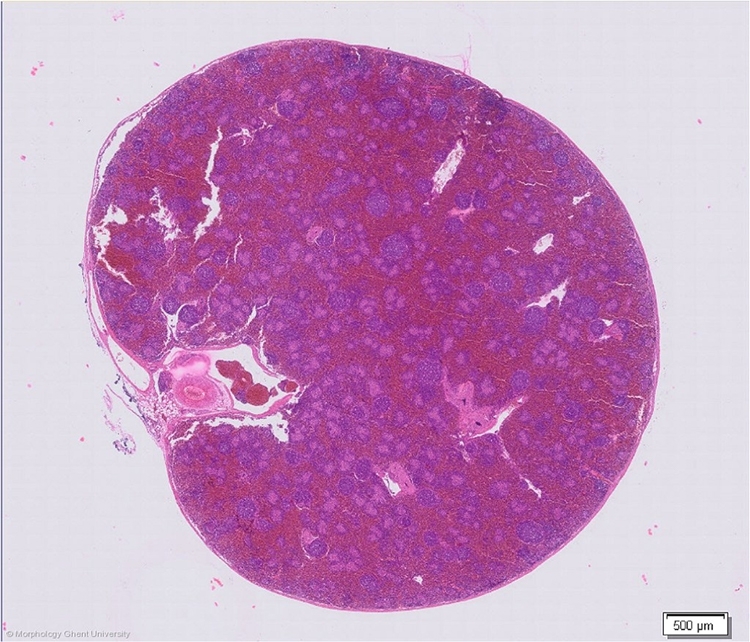 The avian spleen (splen) is a secondary lymphoid organ which most important functions are: (1) production and storage of (primarily B ) lymphocytes; (2) filtration of blood and destruction of erythrocytes and antigens. In birds, the spleen does not play an important role in the storage of erythrocytes or in erythropoiesis. The shape, size and mass varies amongst species. The spleen of the chicken is egg-shaped, in pigeons it has an oval shape and in waterfowl a pyramidal shape. Spleen mass can even vary tremendously intra-individual, depending on the season, oncoming migration, stress level, parasite load etcetera. In chickens, accessory spleens may occur.